Scientists from the CNRS1 and the Université Libre de Bruxelles (ULB) have put together the first global map of the distribution of atmospheric ammonia (NH3) by examining measurements taken by satellites between 2008 and 2016. The IASI interferometer built by the CNES enabled them to catalog over 200 NH3 sources, two-thirds of which had never been known before. These sources are fundamentally sites of intensive livestock production and industrial activity. The team’s findings are reported in the December 5th issue of Nature. For the past twelve years, the IASI interferometer on board three successive Metop2 satellites has been feeding researchers with global data on different atmospheric components, including NH3. Atmospheric NH3 merits special attention as it breaks down into fine ammonium salt particles that degrade the air quality you breathe. Yet the processes controlling concentrations of this gas are still not properly understood, particularly on the local scale. 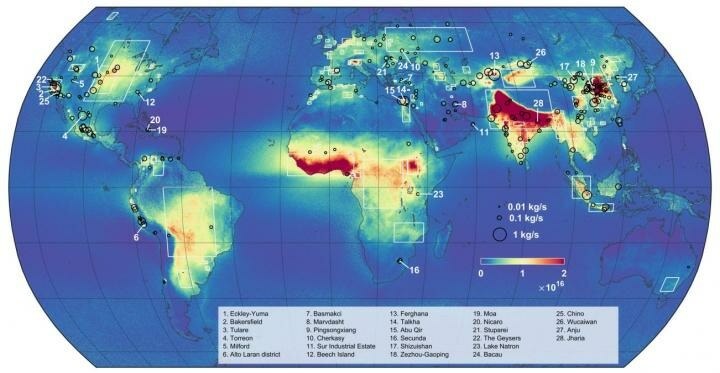 Employing the daily data on NH3 levels recorded by the interferometers over a period spanning close to a decade, the scientists produced a map of the global atmospheric distribution of NH3 whose resolution is on the order of a square kilometer. By integrating their map with satellite imagery, they uncovered and categorized 241 point sources of anthropogenic NH3 emissions—83 related to intensive livestock production and 158 to industrial activity—as well as 178 wider emission zones. As well as recording new sources not found on existing emission inventories, the research has revealed that levels of emissions from formerly identified sources are critically underestimated. By observing variations in the data over time, the team was also able to trace developments of the related human activities, like the startup or shutdown of industrial complexes or the expansion of infrastructures for intensive animal farming. These findings suggest that improved management of the impact of NH3 pollution requires a complete review of NH3 emissions, which are a lot higher than currently suggested by inventories. 1 These scientists belong to the LATMOS research laboratory (CNRS/Sorbonne University/Université de Versailles Saint-Quentin-en-Yvelines). Along with eight other labs whose research focuses on the global environment, it is a part of the Institut Pierre Simon Laplace (IPSL). 2 Launched by the ESA and EUMETSAT in 2007, the Metop program continuously records atmospheric composition by satellite. The data collected will ultimately cover a period of 18 years. Three satellites have been deployed in succession, the last being Metop-C, commissioned on November 7, 2018.